1756 Correa Way, Los Angeles, CA 90049 | Sotheby's International Realty, Inc. 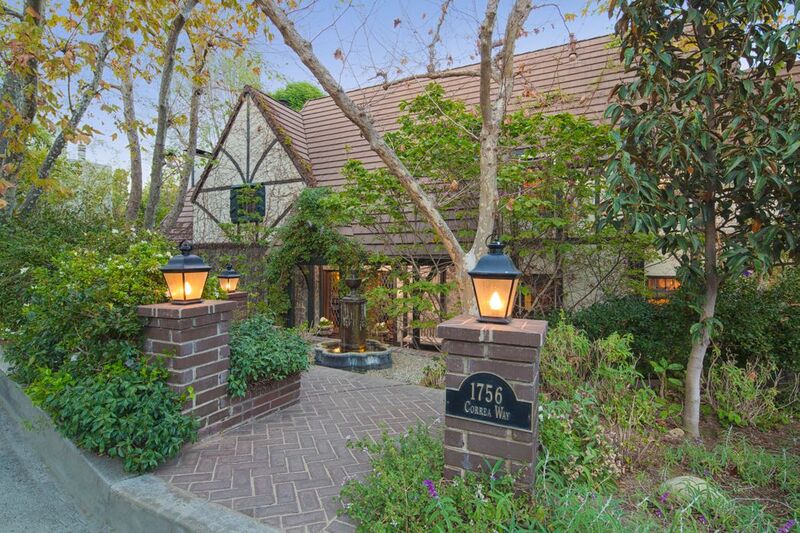 Available for short term rental at 28k per month -Distinguished Tudor style home on quiet cul de sac with with stunning ocean and scenic city lights views ideal for a large family. Features include vaulted ceilings with exposed wood beams,stone and brick fireplaces, chandeliers, recessed lighting, French doors on all floors enhance the indoor/outdoor lifestyle.Gated grounds are grassy with a fenced in patio around the private pool and spa located just outside the den.Main level has a large step-down living room with fireplace, formal dining room with built-in cabinets,den with wet bar,and wood paneled library may be used to entertain casual gatherings or professional meetings.The kitchen has stainless steel appliances, marble counters,and a large food prep island.Master bedroom is light and bright with a cozy fireplace.Master Bath has dual vanities, step in shower, & hot tub.The lowerlevel has 2bedrooms that may be used as offices,gym,playroom,or maid's quarters.Partially furnished.